If you take a lot of screenshots on your PC, you’ll be happy to know that Microsoft is making it a whole lot easier to do more with them in Windows 10. 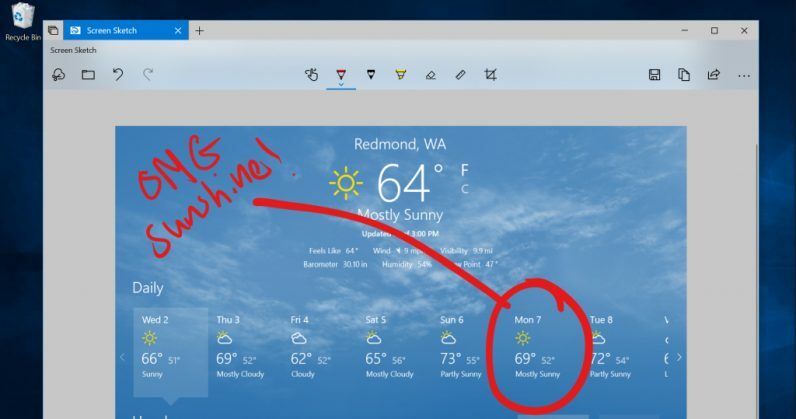 If you grab the latest Windows 10 Insider Preview Build, you’ll find that the Screen Sketch annotation tool that was previously part of Windows Ink for touchscreen devices is now a standalone app. That means you can invoke it by pressing WIN + Shift + S, and then select an area on the screen to capture. Alternatively, you can find in the Action Center, or configure the Print Screen key to bring up Screen Sketch instead of merely copying your screen’s contents to the clipboard. Once you’ve captured a screen with the new standalone app, you can then annotate it as you like with a bunch of different brushes and pens, or share it via Mail, Skype, and Microsoft Store apps like Twitter. If you’d like to try it, you’ll need to ensure you’re signed up to to the Windows Insider program, and opt-in to receive Fast ring updates. If you’ve got a touchscreen laptop or tablet, you can fire up Windows Ink Workspace and look for Screen Sketch there to see how it works right now.